*Overview of various incubators on the market. *Proper incubation technique, what temperature and humidity to be aiming for. (A handout will be provided covering this). 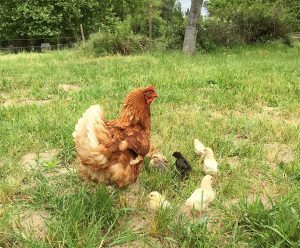 *Incubating with a machine vs. a broody hen, health benefits of both methods. *Selecting eggs to incubate, testing for fertility and viability. (We will crack an egg open to show signs of fertility). *Feather and egg color genetics of breeds, how to create your own breed (A handout will be provided with charts for easy reference). *Holistic health management of the flock. *Setting up proper biosecurity and how to maintain it. *Signs and symptoms of sickness, overview of various common illnesses. *What to keep in the home veterinary kit.